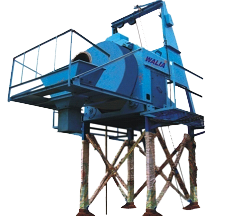 WALIA STATIONARY REVERSIBLE DRUM TYPE BATCHING AND MIXING PLANTS, are Designed and Developed Indigenously and are available in 15m3 / Hr., & 20m3 / Hr. Capacities with Aggregate Storage Hopper, Pneumatic Control gates, Cement Screw Conveyor, Load cell based weighing system, Skip hoist, Water dozing arrangement and all operations are controlled through one MIMIC control panel by one operator. Fully automatic Computerised Control Panel. OPTIONAL EXTRA - BATCH WISE TABULATED PRINT OUT. PP - 15 MODEL NO.